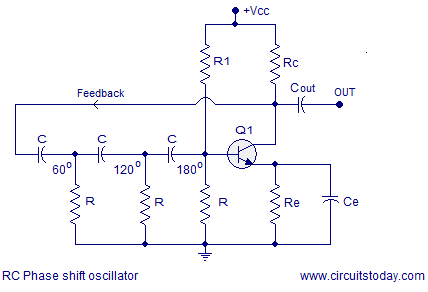 RC phase shift oscillator or simply RC oscillator is a type of oscillator where a simple RC network (resistor-capacitor) network is used for giving the required phase shift to the feedback signal. In LC oscillators like Hartley oscillator and Colpitts oscillator an LC network (inductor- capacitor network) is used for providing the necessary positive feedback. The main feature of an RC phase shift oscillator is the excellent frequency stability. The RC oscillator can output a pure sine wave on a wide range of loads. RC phase shift network is a simple resistor capacitor network that can be used to give a desired phase shift to a signal. The circuit diagram of a simple single stage RC network is shown in the figure below. Theoretically in a simple RC circuit , the output voltage will lead the input voltage by a phase angle Â Î¦ =90Â°. Anyway in Â practical case Â the phase angle will be something below 90Â° just because it is impossible to get a purely ideal capacitor. Phase shift of Â a practical RC network depends on the value of the capacitor, resistor and the operating frequency. Just by making an RC network with phase shift equal to 60Â° and cascading three of them together the desired phase shift of 180Â° can be attained. This 180Â° phase shift by the RC network plus the 180Â° phase shift made by the transistor gives a total phase shift of Â 360Â° between the input and output which is the necessary condition for maintaining sustained oscillations. The circuit diagram of a three stage RC network producing a phase shift of 180Â° is shown in the figure below. Connecting such a three stage RC phase shift network between the input and output of a common emitter transistor amplifier will result in a transistor based RC phase shift oscillator. The circuit diagram is shown below. Where F is the frequency, R is the resistance, C is the capacitance and N is the number of RC phase shift stages. The RC pahse shift oscillator can be made variable by making the Â resistors or capacitors variable. The common approach is to leave the resistors untouched the three capacitors are replaced by a Â triple gang variable capacitor. 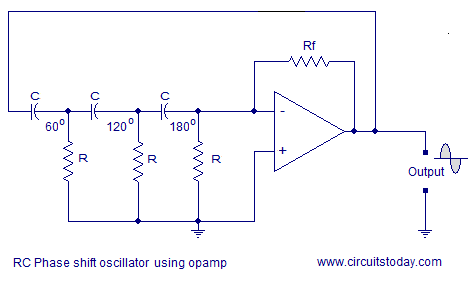 RC phase shift oscillator using opamp. The circuit diagram of an RC phase shift oscillator is shown above. Feedback resistor Rf and resistor R (close to the inverting pin of the opamp in the circuit) is used to set the gain of the oscillator. Three stage phase shift network comprising of R and C produces 180Â° phase shift and the opamp itself wired in inverting mode produces another 180Â° phase shift. Thus the required phase shift of 360Â° is obtained between input and output. In rc phase shift oscillator vcc is a dc supply and how it is possibl to rc circuit give alternating current without any ac current becoz capa. Blo.ck dc current .we are give only dc. Plz rply. Is it possible to get triangular output for RC PHASE SHIFT OSCILLATOR using OP-AMP???? I got triangular output. But i dont know whether its correct or not… plz reply me its very urgent….